Nothing beats a basket of warm, fresh-baked Cranberry Oatmeal Muffins sitting out on your kitchen counter. There’s something about homemade muffins that just doesn’t compare to the purchased variety. Soaking the oats in the milk helps to make the muffins moist and tender, so don't skip that step. Spray 12 standard muffin pan cups with cooking spray or line with paper liners. Combine the old-fashioned rolled oats and the milk in a small saucepan. Bring the mixture just to a boil, remove from the heat and stir in the butter until melted. Set aside to cool. Combine the flour, sugar, baking powder, baking soda and salt in a large bowl and whisk to blend. Add the eggs to the cooled oat mixture, stirring until blended. Add the oat mixture to the flour mixture, and stir just until blended. Stir in the cranberries and nuts. Do not over mix. Spoon the batter into the prepared muffin pan cups. Bake 20 to 25 minutes or until a toothpick inserted into the center comes out clean. Set pan on a wire rack and let cool five minutes. Remove muffins from the pan and set on the rack to cool. • Gentleness is the key when mixing the batter. 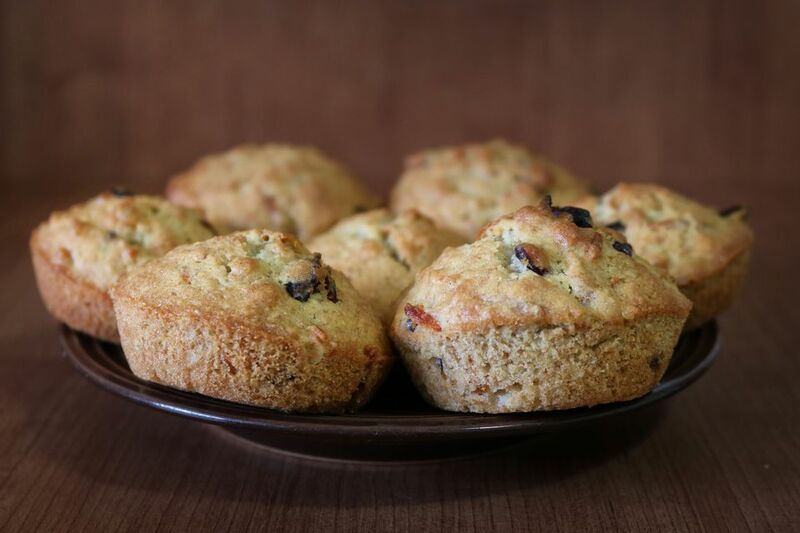 Too much stirring overdevelops the gluten in the flour, resulting in dense, rubbery muffins. • Baking at a relatively high temperature in a fully preheated oven is essential for quick rising, even browning, and a nice crust. If the oven is too cool, the muffin tops will be flat. • If you are not using foil muffin cups, grease muffin tins thoroughly, even nonstick ones. Grease the top surface of the tin too, so muffin tops won’t stick. • To store muffins, place them in a plastic bag, seal, and store at room temperature for up to 3 days. • To freeze muffins, wrap them tightly in heavy foil or place them in freezer bags, and freeze for up to 3 months. To reheat, wrap frozen muffins in heavy foil. Heat in a 300°F oven for 12 to 15 minutes.